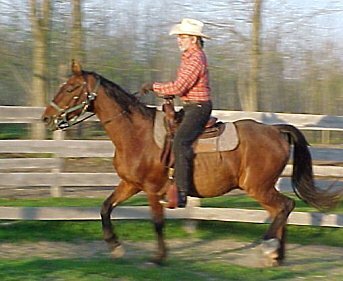 Cowboy Bob's Home Spread - horse riding and horsemanship tips, photos, stories, and more for cowboys and cowgirls of all ages! Here's yours truly and Willy when Willy was 26 and before his health began to fail. Willy's registered name is "Birchwoods King Supreme," but that's a bit of a mouthful, so he was usually just called Willy. I have no idea who gave him that nickname originally. During the time I had him, we've had hundreds of folks of various sizes on Willy. 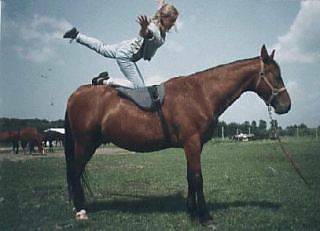 Some of the more advanced students developed their sense of balance and the way a horse moves by doing some basic equestrian vaulting moves. (Vaulting is probably best defined as "Gymnastics on Horseback"). Yep, that's yours truly forkin' his first bronc at the ripe old age of 28 months. Cowboy Bob's Home Spread is "Bobby Approved" -- meaning these pages are -- and have been since 1999 -- accessible to people using assistive technologies to view Web pages. Find the the Home Spread useful? Help support it! COPYRIGHT © 1999 - 2019 BOB LEMEN, GRAND RAPIDS, MINNESOTA. ALL RIGHTS RESERVED. The contents of this document are not for reproduction. Special thanks to: Michael G. Shaikun and the Animated Gif Artists Guild for providing the following files: cow.gif, flame.gif, projector.gif and sissy.gif; www.aaaclipart.com for the up arrow and left arrow icons; Bayside.net for twirls.gif; and Raimund of www.rwexports.com, who supplied the animated running horse rule and the animated horse which served as the base for my small running Willy picture. All other artwork by Bob Lemen, used under license, or as otherwise credited.